During our time at Savannah, we did the occasional safari for our own company. This was one of those occasions. It was a 10 day trip and we spent the last part of the trip in Moremi. We had a couple of exciting events on this trip though.The first event was a run in with a boomslang. 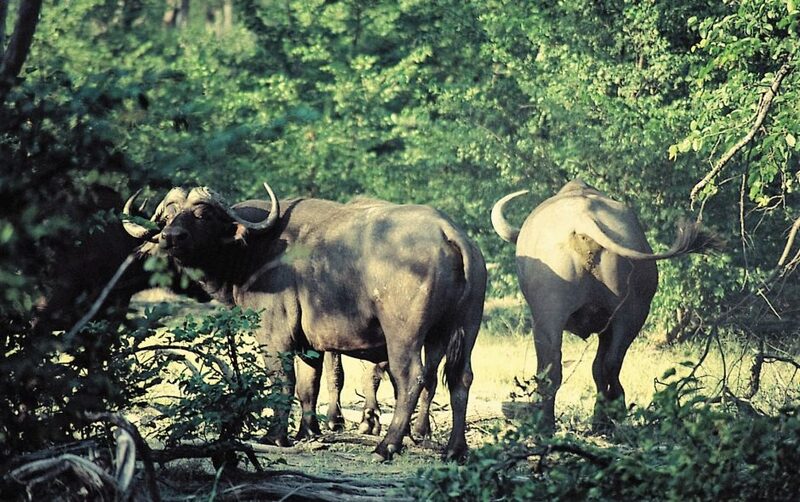 It occurred during a game drive in the Xakanaxa area just near Jessie’s Pools. It is an exquisite area with enormous trees, a lush high canopy and very thick foliage. The road runs along a series of lagoons known as Jessie’s Pools. As we were driving through this forest, we came across a chameleon in the centre of the track. We hadn’t seen one yet on the safari so I hopped out the truck and collected the little lizard. I brought him back to the truck and showed him off to the couple on the back of the vehicle explaining some little fact about the fellow and watching him change colour on my hand. After we had finished discussing him I took him to a bush nearby and released him. As I climbed back into the vehicle I mentioned to Britt who was along with me on the trip, that the chameleon hadn’t looked well and I wondered what was wrong with him. He seemed a little off colour. As we began to drive off, our guests stopped us again, very calmly informing us there was a snake on our roof. Now we had designed the seats on the back of the vehicle so that people seated on the back could look over a rack that extended over the canopy. The snake was apparently now lying on this rack watching them and they wanted to know if it was a dangerous one. We stopped the truck, and not knowing what kind of snake it was, or where it was we asked for a description of the animal and its actions. Neither were particularly helpful, so Britt and I decided to make an exit from the cab. We did so with alacrity not knowing the snakes location above our heads. I climbed on the truck with the guests and we identified the snake as a boomslang. This predominantly green coloured snake is a back fanged creature with stunningly big eyes, almost disproportionally so. This snake is not normally dangerous to humans because of its nature and its fang location. If it does bite a person however the venom is one of the worst kinds. It is haemotoxic, thinning the blood and potentially causing the victim to die of internal bleeding. Anti-venom is incredibly rare. We climbed off the truck. Once off the truck,it was time to remove the snake. We searched for a long stick and as we tried lifting the snake off the vehicle it decided to rather climb into the cab where it positioned itself behind the sun visor. As we could no longer continue our drive with the boomslang behind the visor we now had to get him out. I flicked him out of the car and onto the ground where he climbed into the chassis framework. While we were doing this a number of game drive vehicles came past us each offering assistance. When we explained our predicament, each without fail said, oops sorry, bye. Eventually we managed to siphon some fuel out of the tank and sprayed this into the chassis frame. The smell of the fuel drove the snake out and we flicked him off to safety in the bush. As soon as we knew we had everything under control we took out the snake book and read up about our friend the boomslang. The book said their favourite food was, you guessed it, chameleon, and in fact they are so fond of these that once bitten, they would follow them anywhere. We would have to agree as this snake had leapt out of the trees to follow his chameleon, and this also explained why our chameleon was under the weather. He was lunch. The other incident also took place in Moremi. We had camped out at a HATAB site which are sites reserved for members of companies belonging to the Hotel and Tourism Association of Botswana. They are all located alone, are unfenced and have no amenities or neighbours. They are truly designed to give an amazing bush experience. Our site was located on a road situated behind third bridge. Throughout the safari, Britt had been surprising us with her ability to spot animals in the bush as well as her hearing that picked up noises we never heard. Constantly when we were in camp, she would say things like Elephant, or Lion, or Jackal, or Hyaena, and we got into the habit of stopping whatever we were doing and listening for a noise. It was really good having her around as she added so much more detail to the trip had she not been with us on safari. As it happened we were pacing camp on our last morning and our camp was situated under some wonderful trees, with scattered termite mounds and next to a small lagoon. Really a very pretty site. While we were rummaging around packing up the camp, Britt said “lion”. Every one of us stopped what we were doing and listened for a few moments. Nothing. So we carried on packing. Britt said “Lion” still not agitatedly at all. We all stopped and listened. Still nothing. We carried on. Britt said “lion”. This time I asked her, “how far away babes because we can’t hear anything”. She said, “No, I can’t hear them, I can see them there” she pointed towards the small lagoon. We all looked and there were 2 female lions lying on a termite mound in the midst of camp watching us pack up. We started to merge together and Britt asked what we should do. I asked her to walk the guests back to the car and to climb on the roof. No running. Britt and the lady on safari began climbing up the vehicle from the front where the bulbar is located. As they laid their hands on the vehicle the ladies husband ran up behind them and laying his foot on his wives back, leapt up to the roof of the vehicle. I guess gallantry is not what it used to be. As we watched the lions got bored of us and wandered off to the bush. We carried on packing up camp and left the park. Our guests didn’t speak to each other all the way back to Maun. We received a package from them 6 months later, they had sent me a book about Native American tracking skills and a letter in which they admitted the lion incident had been a great surprise to both of them and the lesson learned was helping build a very strong foundation in their marriage of focussed unselfishness. A good lesson for any marriage apparently.